After a water and fire cleaning stop at Lindong and a short time in the loop at Dariqiga to cross the eastbound passenger, QJ 7048 and QJ 7012 were back on the long climb to the summit west of Chaganhada when they passed the photographer at 06:23 on 3 September 2005. 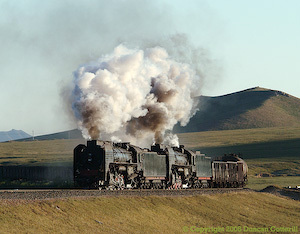 Shortly after sunrise on the morning of 2 September 2005, QJ 7012 led a westbound freight around the lower horseshoe curve below Lindong and into the clear early morning light. 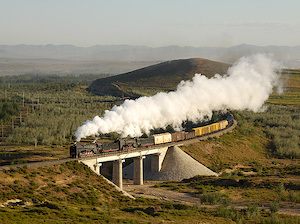 QJ 7038 and QJ 6984 headed a westbound freight over Brownie's Bridge early on the morning of 4 September 2005. Of all the fine locations on the Daban - Chabuga section, this spot between Lindong and Dariqiga has to be my favorite. QJ 7037 was working flat out as it passed the busy crossing at Xinlongdi, east of Diaojiaduan, with an eastbound freight on 8 September 2005. 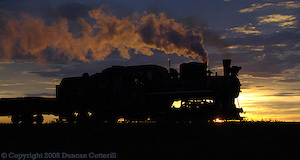 There's something magic about steam locomotives at night. Here QJ 6878 and QJ 7037 wait for the signal to leave Daban depot and move off to the station to collect their train on the evening of 5 September 2005. This is how I'll remember the Daban - Chabuga section; big engines running hard and fast on heavy trains across a wild undulating landscape. 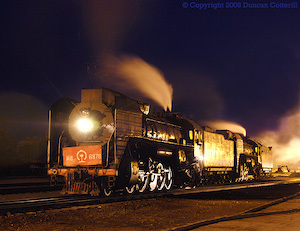 QJ 6981 was taking a run at the bank out of Yamenmiao with an eastbound freight shortly after sunset on 6 September 2005. While it's sad to think that we'll never see the likes of the JiTong line again, it's fitting that the main line steam era went out in such fine style. It was fantastic while it lasted. 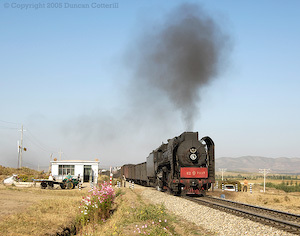 Loco number 044 approached Xiahua with a train of empties on the morning of 15 September 2005. This picture shows No. 168 working flat out on the final section of the climb to the summit with a train of empties on 16 September 2005. No. 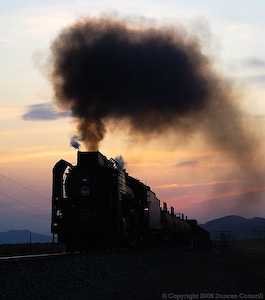 044 runs into Xiahua with a train of empties from Huanan at sunset on 13 September 2005. 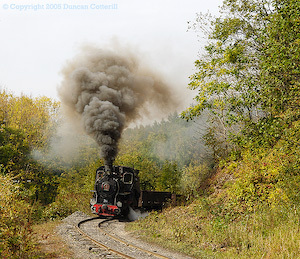 This year’s late summer / early autumn visit to China was essentially a repeat of last year’s with a final visit to see steam on the JiTong line followed by a trek to the Huanan narrow gauge line in the far north east. Our group comprised Peter Breeze, Bryan Acford and myself. We were joined on the Jitong line by John Chalcraft and John Day (UK version) and at Huanan by Robin Gibbons. All arrangements were made by Sun Xiaolan who accompanied us as guide. We travelled north on train K274/275/277 from Beijing Bei to Chifeng. A standard green DF4B brought the train into Beijing from Datong while another member of the same class took it forward to Longhua. The next leg to Chifeng was worked by a DF4D. Freight traffic between Beijing and Longhua was hauled by a mixture of DF4B and DF8B. Beyond Longhua, DF4C predominated but a number of DF8B were also seen. Passenger traffic was all DF4B west of Longhua with DF4C on locals and DF4D on expresses east of there. No active BJ were seen although a number of them were rusting away at Longhua depot. The line is extremely scenic and travelling the whole distance in daylight was an worthwhile experience. We continued from Chifeng to Lindong by road, driven by our old friend Li Wei Feng. 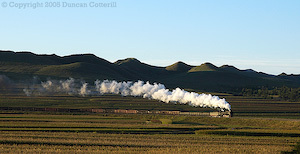 The Daban – Chabuga section was almost entirely steam worked during our stay. Over 10 days, no more than 4 diesel workings were encountered, all of them taking locos to/from Tongliao for maintenance. The active steam fleet had been reduced to 23 locos at the time of our visit. QJ 6981 was Daban pilot and QJ 6991 Chabuga pilot. The remaining 21 locos handled all the line work between them. There was little spare capacity with every loco being booked out on 11 September and around 19 locos seeing action on the average day. To address a couple of points in recent reports; QJ 6878 was still in traffic on 11 September. It must have been temporarily stopped when Dave Fielding saw it earlier. We saw no sign of the mysterious QJ 6838, a Baiqi engine that went straight into store and was never reported in traffic. QJ 7164 was the latest withdrawal and was in the dump compound when we visited Daban depot on 5 September. It couldn’t have been there long as water was still draining from the boiler. QJ 7081 was the usual loco on the stopping passenger trains and QJ 7030 performed regularly on L114, the Hailaer – Hohhot express, which ran every other day (09:21 ex Chabuga on even dates). L113 and L114 were due to stop running on 14 September, round about the same date that 6051 and 6052 were rumoured to change to diesel haulage. Neither of these changes can be confirmed as we left the area on 11 September. Most freights were double headed but when traffic was heavy more trains were hauled by a single loco. These trains didn’t appear to be any shorter than those handled by pairs of QJs but we got the impression that there simply weren’t enough locos available to provide a double header for every train. Traffic levels varied a lot from day to day. A good day would produce as many as 9 workings each way in daylight but there were other days when as few as 5 trains ran. The mornings were usually OK but there weren’t that many afternoon trains. Daban and Chabuga depots tended to be very quiet as so many locos were out on the line. Locos were generally in good condition although some engines were beginning to look a bit tired. Staff at Daban told us that QJ 7010 and 7049 would be going to works soon for a full overhaul, a special paint job and fitting of decorations. They would be 2 of the 5 locos retained after the end of normal steam working. It was also confirmed that diesel working between Daban and Chabuga would start in earnest on 1st October and that 8 new diesels would arrive at Daban by mid October. Dumped - Main Depot Area : QJ 6639, 6751, 6840, 6850, 6853, 6926, 6996, 7009. Dumped - Compound : QJ 6763, 6795, 6825, 6828, 6844, 6849, 6851, 6876, 6882, 6884, 6900, 6905, 6911, 6925, 6977, 6978, 6986, 6992, 7007, 7041, 7112, 7137, 7164. The weather was mixed during our visit. We did have some gloriously clear sunny days but there was some hazy light and long cloudy periods as well. On the day we left there was unbroken cloud all day but that was the only complete write off. We travelled from Chabuga to Tongliao by road, stayed overnight at Tongliao then continued by train to Siping and then Harbin. Harbin to Huanan was again by road due to the lack of a convenient connecting train. It was a long day but at least it got all the travelling out of the way in one go. Tongliao based DF4A, DF4B and DF4C worked freight between Tongliao and Siping. After Zhengjiatun a number of Baicheng based DF4B were also seen. Passenger trains were worked by 2xxx series DF4B and by DF4D. Our train, 4228, was DF4B hauled. Two diesel worked narrow gauge sand railways were noted at Menda and Baishi west of Zhengjiatun. We continued to Harbin on train 2509 behind SS9 0007. Surprisingly, this train did not have a soft seat coach and the single hard sleeper was full so we travelled in the diner. On the main line north of Siping, SS4G predominated on freight with SS9 and SS9G on passengers. A few DF4B were also seen on freight and there were a handful of DF4D hauled passengers but the bulk of traffic was electrically hauled. At Changchun, the depot still appeared to be in use, stabling DF4s of all varieties and a handful of SS9 and SS9G. The main line to Harbin was being upgraded with a lot of engineering work in progress including new alignments smoothing out many of the curves. The railway opened again on 9 September following the recent shutdown and by the time we arrived operations were in full swing. Workings followed the usual pattern with a loaded train running approximately every 4 hours. We only saw one instance of a short working between Lixin and Xiahua. Every other train worked through to or from Huanan. Locos 04, 044, 168 were in use and all were very clean. We didn’t visit the shed. Again, the weather was mixed but there was a lot of sunshine on the first three days. By mid afternoon on the fourth day, the sky had clouded over completely and remained like that for the rest of the day. Faced with an overcast day at Huanan, we decided to have a look at Hegang instead. Our tickets back to Harbin that night were from Hegang anyway, so it made a lot of sense to get on the train at Hegang as well. We travelled the 150 km by road from Huanan. While Xiaolan went to collect the tickets, we visited the mine railway’s depot where SY 0799, 1498, 1685, 3013 and 3014 were in steam. SY 1370 was being overhauled and SY 0354, 0472, 0561, 3023 and 3024 were dumped. The last 2 are notable as they were among the last of the class ever built but only lasted a little over 5 years in traffic while SY 0799 still remains active after 30 years of use. Two unidentified SYs were also seen in use. It was just as well we went to Hegang as our train had been retimed and we would have missed our flight from Harbin to Beijing if we hadn’t changed our plans. As the weather showed no sign of improving we headed back to Jiamusi by road and then took N8 to Harbin at 13:20. This train was worked by one of the DMU sets, similar to those on the Jitong line but all hard seat, and was non stop all the way. There was much evidence of rebuilding along the route with extensive engineering work, new alignments, bridges and tunnels under construction. Freights were hauled by DF4B and DF4C while passengers used orange DF4B and DF4D. A couple of the passenger DF4B were in orange livery even though they weren’t from the usual 2xxx series. This is also a very scenic line, particularly the section either side of Nancha where the line runs along a curving river valley between forested mountain ranges. Nancha itself came as a bit of a shock. The town seems to have been bypassed by the economic boom that has swept the rest of China and didn’t appear to have changed significantly in the last 10 years. Langxiang, the location of a long closed narrow gauge forestry line, didn’t appear to have been modernised at all. After staying the night in Harbin, we flew back to Beijing the following morning and became “normal” tourists for the day. After two weeks when we appeared to have all of China to ourselves, fighting through the crowds at the Summer Palace took the edge off the experience. When I wrote my report on our December 2004 trip to the JiTong line, I really didn’t think full steam operation on Daban – Chabuga would last this long . . . but it has and it’s still as good as ever. 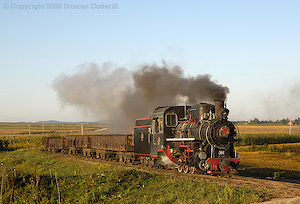 There really is nothing to compare with the sight and sound of a big engine on a heavy train pounding across the veldt at speed in glorious early morning light. It’s sad to think that it will be all be over in a matter of weeks but at least main line steam is going out in fine style. The biggest surprise was how few people we saw at the lineside. I would have expected many more to have made the effort to see the world’s last steam worked main line before the diesels start taking over in early October. However, we basically had the line to ourselves most of the time and were never aware of more than one other group being around at any time. Although Daban - Chabuga may not have the impressive civil engineering and dramatic scenery of Dabaliang, it does have a fair selection of excellent photo positions and if you like fast hard running, it’s in a class of its own. If you haven’t been yet then you’ve probably left it too late. After so many years, this really is the end of the end! Huanan is one of the best industrial systems left. It may be narrow gauge but it has a main line feel to it with trains running considerable distances and tackling a mountain pass en-route. The scenery is superb and access to the best parts of the line isn’t as difficult as it appears if you're prepared to walk. It’s definitely worth making the effort to visit but watch out for extended shutdowns around the major public holidays. The line usually closes for around 6 weeks for Spring Festival and will shut down for 10 days over the 1 October break this year. Hegang didn’t strike me as a particularly attractive operation. It appears to have too many poles and wires but too few steam workings and little attractive countryside. I don’t think I’ll be going back in a hurry.